This is probably the best book I have ever read that puts you in ancient Rome. 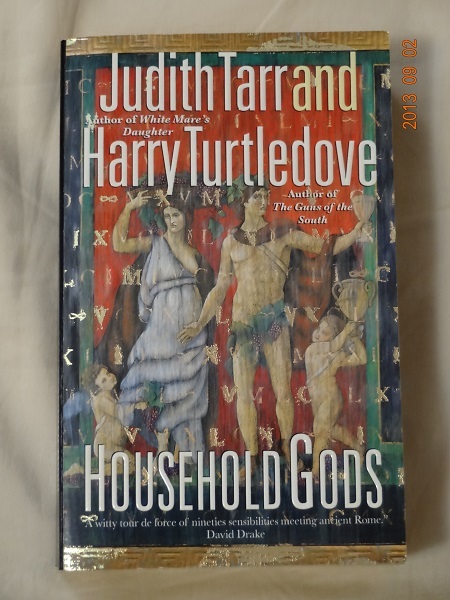 I do not like Harry Turtledove’s writing. Why, I do not know. I read his Agent of Byzantium years ago and I just did not like it. Besides, he writes an alternate history of the American Civil War, where the south won. It just does not appeal to me. Judith Tarr’s name is listed first, and this is the only book I’ve read of Tarr’s to date. Whether it was her doing most of the writing, a collaboration of the two, or Turtledove supplying the research to Tarr (he has a Ph. D. in history), the book is a page-turner. Anyone who wants to learn what life was like in the second century near the Roman border in Austria, this is a must read. Nicole Gunther-Perrin, a divorced mother of two, lives in Los Angeles and works at a law firm in the last decade of the 20th century. Her husband, a professor, ran off with one of his students half her age; they married. Nicole got the custody of the children, but the child support is usually months late as ex-hubby is busy traveling around with his youthful bride. We learn a lot about Nicole before she makes her trip back to Rome. She hates her job, hates her life, and is basically burned out on everything. Ironically, the best time she remembers having is being on her honeymoon and visiting the ruins of Carnuntum, a Roman city in what is now Austria. She admired the ruins and the Romans. Having bought a statue of Liber and Libera, Roman fertility deities, while there, she prays to them for a simpler life, a life that would take her away from the one she is suffering through. She gets her wish and wakes up in Carnuntum. She inhabits a woman’s body which she knows is an ancestor of hers. She’s now an innkeeper and tavern owner. She has two children and a slave. Thus Nicole must come to grips with Rome in the second century on the frontier. Her education starts right away as she watches a woman coughing up black mucus in the baths, and watching it disperse in the water. Immediately she fears tuberculosis. This is just one surprise for her as plague, a barbarian invasion, and the inevitable return of Roman rule affect her and her family. Her visit to Rome gifts her with the Latin language. Her mind is intact, and she puts her knowledge of the law to work. After an incident where she is wronged, Nicole writes to Marcus Aurelius, the philosopher emperor, informing him that he is ultimately responsible as the head of the Roman state. Her letter merits an audience with the emperor, which is quite interesting. The book simply does not end with her return to Los Angeles. No, we get to see how her experience in the past has changed her for the better. Her entire attitude shifts and, because of that, she finds that her life isn’t all that bad, and is getting better. At least it is much easier living in Los Angeles than in second century Rome. I loved this book. I can remember so many of the details even though I read it several years ago. It is a big novel at 664 pages, but well-worth the effort.